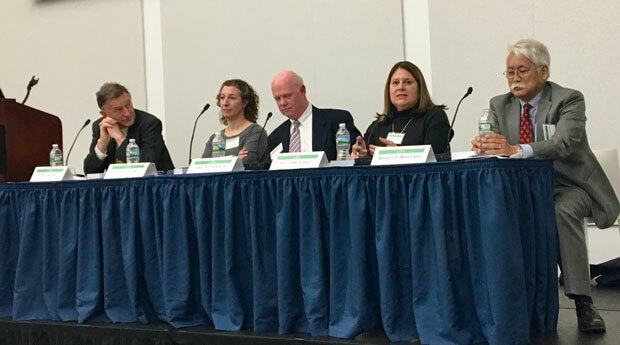 Evelyn Suarez spoke at the U.S. Trade Policy Panel on WTO Participation and Potential Violation, presented by the International Trade and Investment Law Society. The panel discussion took place on April 2, 2018, at the American University Washington College of Law in Washington, DC. Featuring experienced trade negotiators and WTO litigators to speak on both domestic and international impact of the recent tariffs on Steel and Aluminum, Section 301 investigation against China on intellectual property, Canada’s WTO challenge on US trade rule book; more generally, the legal implication of US trade policy, and new direction of Free Trade Agreement under the WTO.